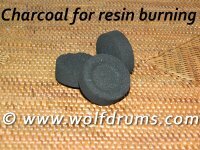 Charcoal for incense and resin burning. 10 disks is each roll. Burn time: Approx burn time is 60min per tablet.